In 1994 Rev Ross Rennie, then a recent Bible college graduate, visited Cambodia for the first time. After Ross had been moved by watching the film The Killing Fields, God had spoken to him about sharing the good news with Cambodian people. During his 1994 visit Ross stayed with Myers Cooper, who had been working in Cambodia as Administrator for Southeast Asian Outreach (now Cambodia Action) since 1991. One Sunday Myers invited Ross to accompany him to the church he attended. At that meeting the Holy Spirit came upon the congregation with great power, and Ross received from God a commission to establish a 'Samaritan Trust' that would bring finance and other resources into Cambodia for the work of the Kingdom of God. Shortly afterwards Ross met a group of Cambodian church leaders and together they committed themselves to establishing a non-denominational Christian centre on land that had formed part of the 'killing fields', where Cambodian people had been murdered during the Khmer Rouge regime. 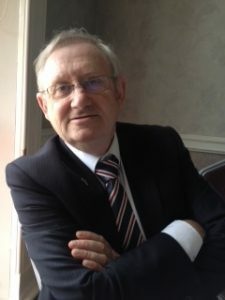 Ross returned to his home in the United Kingdom, where he founded Cambodian Communities out of Crisis (CCC). He invited some of his friends to become the first Council members and appointed Myers as CCC's honorary representative in Cambodia. CCC began to raise funds, which were initially used to support the newly formed School of Practical Ministry Cambodia (SPMC), while Myers helped to set up SPMC's administrative systems in Cambodia. During a visit to Cambodia in 1996, God prompted Ross and CCC Treasurer Tony Nixon to make a grant to pay for three young Cambodian men to take courses in business studies at a college in Phnom Penh. This was the beginning of CCC's programme of student sponsorship, which has continued to the present day. In 1999 God gave to CCC a vision for a Christian college of further and higher education, to be called 'Timothy College'. CCC Council members shared this vision with Cambodian church leaders and received their support for the concept. To reflect their aspiration that part of the college's purpose would be to train Cambodian men and women to engage in business, CCC subsequently renamed it 'Timothy College and Business Institute'. One of the Christian leaders whom Ross met in 1994 was Barnabas Mam. Soon after their meeting Barnabas founded the School of Practical Ministry Cambodia, which CCC supported and which Myers Cooper helped to set up. 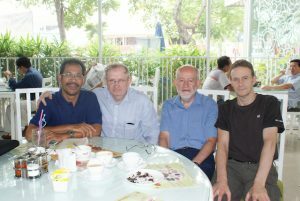 Ross and Myers have remained good friends with Barnabas, who for several years served as CCC's Honorary Chairman in Cambodia. Barnabas is now Asia-Pacific Ministry Advisor and Cambodia National Director of Ambassadors for Christ International. CCC enjoys good relationships with a number of churches, associations and mission agencies in Cambodia and works in partnership with the Living Hope in Christ Church and its association of churches. CCC also values its membership of Global Connections, a UK-based network of agencies, churches, colleges and support services who share the vision of "mission at the heart of the church, the church at the heart of mission". Alongside fundraising to purchase land for a campus for Timothy College and Business Institute, CCC continues its student sponsorship programme and supports the ministry of Awana Cambodia.